what i thought would be an ordinary weekend turned into a great weekend. i took it easy, ate good home cooking, and got some work done too. i went to sligo with my mum on saturday and i got the greatest pair of shoes ever made. i got some other things too, but on my travels, i went in to a wood carver just off o’connell street, called michael quirke. he used to be a butcher, and used to do carving in the shop to keep himself busy. when more people came in to look at his carvings than buy meat, he turned to carving full time. he specialises in irish legend and folklore, and sligo landscape. he has such a unique style of carving, i love just going in to his shop to have a look at what he’s at and a bit of a chat with him. while we were talking, he asked me what my favourite animal was. i said, a dog. he took what he was doing out of the clamp and stuck in a little bit of wood instead and started chipping away. while he was doing that, he started telling me about the greatest dog of all, Cú Chulainn. then he flipped it over and asked me if i knew Knocknarae. it’s a mountain outside the town with a mound on the top where queen maedbh is suppoed to be buried. then he asked me what i go by, and how i liked to spell it. he chipped in my name, whipped it out of the clamp and gave it to me. the grain in the wood is the sky. he said that at certain times of the year, when the moon is in a certain phase, it sets directly over maedbh’s tomb. how cool is that though. 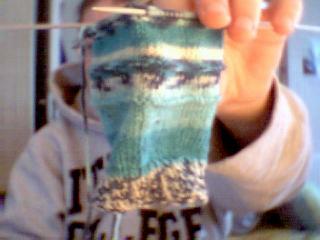 my dad very kindly gave me the lend of a little digital camera he has, so i have some better pictures to show here’s the progress on the sock…. lastly! i picked up a ball of cream wool in sligo to make aoife a scarf. i’m thinking about a narrow version of this. aoife was the girl who made my concerto dress last year, and i’ve always intended making her something to say thanks for doing such a good job. so last night, i slept really badly. i woke up at 3am with my head full of chopin, a really sore throat and a pounding headache. i got up to make some lemsip. when i walked into the kitchen, before i turned on the light, i noticed this strange light coming from the garden. i looked out and it was positively glowing in snow. it was a bit surreal actually. most of it’s melted by now but it still looks very, very cold out. i had nearly a half a ball of the green opal yarn i got at the craft fair left over, and i figured, you can never have too many socks! 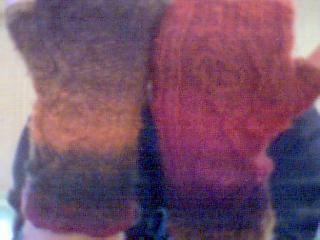 i recently washed the other pair i knitted and they came out fine. i was afraid they’d shrivel up into little bird socks. i also gave the new knitcast podcast a spin. after 16 interviews, i’m enjoying it alot less than i used to. i wish she’d break it up with other knitting news, like funny patterns she’s come across, ideas or ways to integrate knitting into other crafts. in that respect, i think the craftypod has really got the balance right. and speaking of integrating crafts, i’ve been thinking about making a skirt that has knitted panels for a long time. i wonder how well it would work? this is for all ye across the pond. enjoy the four day weekend! 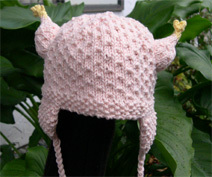 i feel strangely compelled to knit and wear one of these…. the pattern can be found here. i think it’s rather marvellous tbh. i only know it’s thanksgiving in america because my sister told me about it. she’s travelling with her family down (or up/across?) to philadelphia to her husband’s family for the festivities. have fun everybody! so, here’s what i’ve been working on recently. 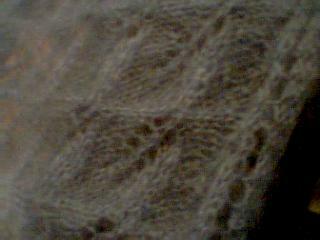 this a really fine-knit lace shawl that i’m giving my mum for christmas. 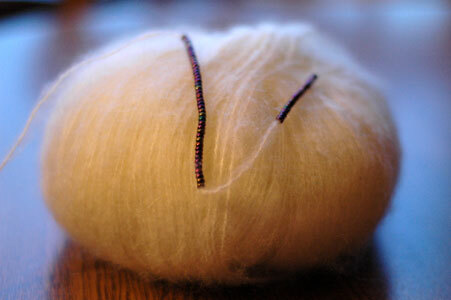 it’s made from rowan’s kid-silk haze which is a mohair/silk mix. it’s really light but very warm. i have to block it yet. here is a close up of the stitch. i got the pattern for it from here. some other items that i finished a while back include the ‘hurry up spring’ armwamers from SNBN…. 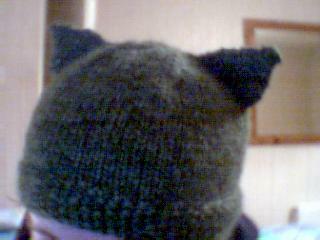 …and a cat hat from SNB.